SILVERSTONE – Daniel Ricciardo back teeth on the second day of testing at Silverstone. 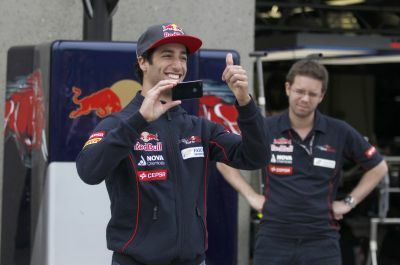 Toro Rosso managed to become the fastest driver of the 15 riders who fell in this test. Having had time to become the fastest driver on the first day of testing at Silverstone on Friday (19/07/2013), Ricciardo is being ogled by Red Bull back was fastest with a record time of 1 minute 32,972 seconds. Toro Rosso actually dominate in this test. Young drivers Carlos Sainz, who became his teammate this time, also ranks second. Interestingly, the third best time also achieved success Ricciardo Championship with 1 minute 33 187 seconds. Pastor Maldonado again disappointing. The Williams driver had to settle for ninth position by making 1-minute 34 116 seconds. Maldonado was lost quickly from Davide Valsecchi, Oliver Turvey, James Calado and Antonio Felix da Costa. Keep in mind, this time the test is one of the advanced program of the FIA ​​and Pirelli tires are trying to solve a problem that had plagued riders broke at Silverstone.